Callistemon rigidus or Stiff Bottlebrush is an Australian native shrub that can get 3-8′ tall with a 6-10′ spread at maturity. This Bottlebrush has a bushy growth habit with stiff stems and stiff linear shaped leaves and will do best on a well-drained soil. 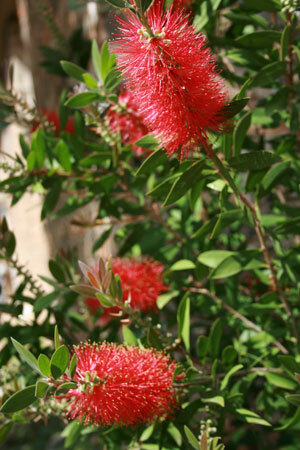 In the summer this Callistemon will bloom sporting spectacular bright red bottlebrush-like flowers that are great for attracting butterflies and hummingbirds. Actually the red that is seen is the showy stamens, as the petals are small and inconspicuous. After bloom the Bottlebrush will have button-like seed capsules. One interesting thing about Bottlebrushes, for us “plant nerds” is the fact that the stems continues to grow after the flowers and seed capsules, so they are not necessarily at the terminal. So there will be foliage, flower or seed capsules and then foliage again. Callistemon rigidus has shown in some trials to be more cold hardy than Callistemon citrinus.